I mentioned on Facebook that I would 'be writing a blogpost about the World Championship' - even though I haven't blogged, apparently, since April. A few people actually asked me to tell them when I posted it. Therefore, I better write it. 1. I did not coach, nor did I even know, any of the Finalists this year. 2. I did compete, but took 2nd at District. For the first time ever. 3. I have competed in the Semi's eight times, the finals twice, taking third in 2006. All finalists are great speakers. All went through the wringer to get there. All gave excellent presentations, and were worthy of being there. Speech contests, and contest speeches, are curious constructs. Judged anonymously by relative amateurs of varying experience and personal speaking ability (some world-class, others working-class, and occasionally, other should-go-back-to-class), the contestants face bias and subjectivity, combined with the unknown factors of who their judges are demographically and ideologically, and it can feel like an impossible task. Populated with mostly amateur speakers of the same varying experience and personal speaking ability, judges are armed with a sheet of objectives the speaker must meet, and then emotionally sort through speeches about dead relatives, terminal diseases, terrible hardship, mixed in with the occasional ego trip followed by the grand victory, occasionally peppered with a nod to mom/grandma/great uncle twice-removed for teaching them right. It also features gimmickry - standing on chairs, props, falling down on stage, and, oh, so much more. Even so, the higher the level, the better the speeches, and for the judges, it can feel like an impossible task. I know this sounds a bit pejorative and sarcastic, but it's truth. The playing field is pretty even for all - so no unfairness is implied. Themes of the human condition are used because they reach the most people. Tony Robbins often says 'success leaves clues' - and the speech contest is full of detectives picking up on what has worked before, so we, more often than not, get served the same messages, in very similar packages, despite the vast diversity of speakers delivering them. 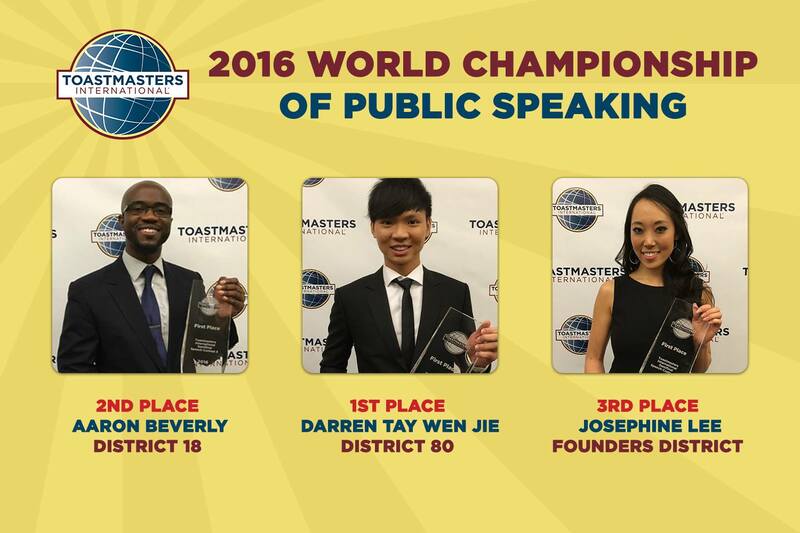 The 2016 World Championship of Public Speaking surely was an impossible task - to compete in, and to judge. 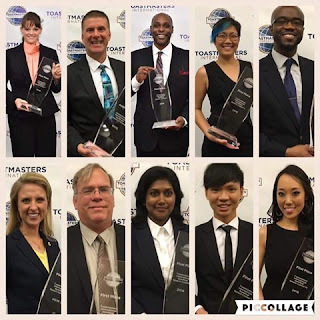 It showed all that is great about the contest and the Toastmasters organization, as well as all that is, occasionally, expected and traditional. I'm going to stay positive in this review, much as I want to be critical here and there. Katina Hunter - An Audience of One. Great chess story, excellent use of short young child vs. tall older child, and the ability to make herself the hero of a story without coming off as arrogant. Donald Crandell - clearly had fun on stage, kept it light, Live With It message was a unique concept. Nice amputee soldier story at the end. Makes me wish my fake leg with help me climb mountains. I think I need an upgrade. Elliott Eddie - one of my favorite topics - Give Yourself Permission. Interesting story about wanting to be a filmmaker and his supportive wife. Kim Kaufman - owned it. Went all in on GPS and the concept of Recalculating - a speech I've almost written myself a few times. Clearly excited about her experience, and her message. Strong close. Sherwood Jones - as a fellow comic book geek, I definitely connected with his opening. Personal Connection message was important and timely. Good humor, and extra points for working in PokemonGo. Kaishika Rodrigo - Loved her pacing and vocal variety. Concept of Chiseling Out Your Masterpiece is another message I've almost used in the past. The whole 'the statue is in the marble, waiting for you to release it' is intriguing. She showed real joy as she spoke. Josephine Lee - 3rd Place - now this young lady knows who she is. She played up the California girl in a way that made it endearing when it easily could have been annoying. Her humor and timing was spot on, and contrasted well with her closing revelation about her friendship. Aaron Beverly - 2nd Place - forever to be remembered as '57-word-title-man', his message that talking a lot doesn't equate to saying a lot was truly original for this venue. Lots of energy, great 'Bus Lady of Doom' story, and excellent delivery almost launched him into first place. Darren Tay Wen Jie - 1st Place - Captain Underwear. Literally put tighty-whiteys on over his pants for the majority of his speech. Took the concept of bullying from external to internal, a theme I have used repeatedly over the years. Grabbed our attention, offered a twist ending, tremendous humor. A worthy champion. Thien Trang Nguyen Pah - her theme of subtle domestic abuse was certainly 'out there' for this contest, just as her 'body image' theme in her semi-final broke the mold. She was emotionally open without being manipulative. The speech was crafted well, in structure, word choice, and staging. She even got a huge laugh in the middle of a tough, tough speech. To me, no other speech approached the 'professional speech' level of this offering. Now, I say this without wanting to take anything away from any other contestant. And with full knowledge that this is my opinion, and will likely be met with opposition. So, sure, it makes sense. But for my money, she was the best speaker, with the most important message, delivered in the most professional way. She didn't need gimmickry. She didn't need a laugh every 12.5 seconds. She didn't have to ask us 'Have you ever....' a million times. She just had to be authentic, identify the problem, touch our hearts, and offer a solution. Hey - they were ALL great, and all of them had an argument for the Big Trophy. For what it's worth, my wife had Darren picked all along. In fact, everyone has their favorite, and no champion is ever unanimous. How long are we going to allow the same formulas, the same message types, the gimmicks, to overwhelm true professionalism? I regularly hear that 'no one would use a speech contest speech in real life', and when I show the championships to outsiders, they laugh at how 'over the top' we are. Is this who we want to be? Is this the type of speaking we want to promote? Darren, all the rest, and even myself must be forgiven for allowing ourselves to fall into this formulaic way of speaking - and even the judges must be forgiven for voting for it - because it IS what it has ALWAYS been for so long. Success leaves clues. Unfortunately, it doesn't always lead to GREATER success. And isn't that what we should be striving for in our crown jewel contest? Thien, if you ever read this, know you are a champion in this speaker's eyes - and, trophy or not, I hope you Win Anyway as you go out into the world to Speak & Deliver the most important messages of all. Darren, Aaron, Josephine, and all other contestants, if you ever read this, I mean no disrespect. You were awesome. You did what you were supposed to do, just as I have tried to do for over a decade now. Enjoy your triumphs, and keep inspiring us to grow. I hope our beloved contest, as well as our organization, continues to grow as well. Insightful post, thanks! As a serial contestant, I always like to see what new aesthetics can be utilized by speakers, be it in word choice, use of metaphor, phrasing, organization, etc. Gimmicks can work too, if they support the message - externalizing the concept and making metaphors concrete allows the message to get in via visuals as well as words. See you next contest season! Great post. Always interested in hearing what you think Rich. T.I. is revamping education, why not speech contests too? Honestly, I got bored of the formula. It's so constricting. I haven't competed in 2 years now and I'm not even sure I'm going to renew as a member this fall. Thien WILL be able to take her message outside of TM (not unlike Patrick Hammond with his anti-trafficking message last year) and I hope she has great success with it. Last year I had a bunch of people over for a WCPS party including some non-Toastmasters. They actually couldn't believe how, well, how kind of silly and meaningless most of it was. They expected so much better. Frankly, I was embarrassed. And I don't like to say this because I understand the time and effort that everyone put in. But this formula is killing us IMO. I didn't even HAVE a party this year- first time in 5 years. I guess I just want more than what this organization is offering as far as competitions go. I wish it wasn't the case because I really did enjoy myself while learning and growing during that time. Check out Agora Speakers International on Face Book. A new international speakers training and educational program about to launch in Oct. 2016. Great post, Rich! Your comment 'How long are we going to allow the same formulas, the same message types, the gimmicks, to overwhelm true professionalism?' is the one of the chief reasons why I have now decided NOT to compete. I have decided that striving to be real is more important than giving a highly stylised stage performance. I concur with Paula. In the outside world, I have had mainly negative responses from even mentioning that I'm a member of Toastmasters because the first thing people mention is this formulaic manner of speaking. They equate it with not being authentic. It's seen as a bad thing. I agree with Paula. This formula IS killing us. Kudos to those who succeed in ticking the boxes. They have earned their success. But I disagree with the 'boxes' that we implicitly require them to tick - or perhaps more accurately, I disagree with the mainstream Toastmasters culture interpretation of those boxes. Thanks Rich for your courageous analysis. I agree and crave a more authentic and meaningful delivery style. Steve Birch, just because TM isn't about the contests for YOU... doesn't mean it's not OK for others to be focused on it. YOU have benefited from the leadership aspect of Toastmasters -- but others have equally benefited from competition. Don't judge. To each his own. Thank you, Rich. I was beginning to think I was crazy, as I had Thien in first place too, although no one else I talked to thought so. I thought she created such a powerfully authentic connection with the audience. I suppose that one person's prop usage is another persob's "gimmick". And seeing as how what I used/did (standing in chairs) was specifically mentioned, I suppose I can't be objective. When Darren LaCroix fell down face first on the stage, I didn't see it as a gimmick or stunt, because it dramatized his message. Far too often though, contestants seem to add something superfluous to their speech just to surprise the audience and judges and stand out. To me, that's the difference between a gimmick and a brilliant bit of stagecraft. Something to keep in mind is that this is a particular contest, with particular rules, for a particular organization. The speeches are what they are, artificial constructs designed to win this particular contest. Like rhythmic gymnastics or basketball, they don't necessarily have to have real world applications. Having said that...The formulaic coaching starts at lower levels. (Q:"Do I need xyz in my speech?" A:"Only if you want to win.") Start change with the oldtimers who advise the contestants at club/district level, and maybe we'll see the variety that such a prestigious event deserves. Very interesting all! Appreciate the discussion and perspectives. I too chose Thien and successfully picked Josephine. Being able to stream everything live added a huge new dimension for me. I feel a transformation coming for me, which is a delight after being a member for 25 years! Contests are a tool for the regular member, a tool that allows one to go from the word to the message. Once you have that, each individual finds another tool for growth. In or outside TM. though all the comments here are interesting and valid, there is still so much else we can get done in TM! just have to find it! Robert I can certainly appreciate your comment about the one you thought should have won. Last year the speech I felt should have won was "I Fell in Love with a Prostitute." The topic was edgy, relevant and well delivered without any gimmicks. But as the contest progressed, I ended up picking the top three who did win. As speakers, the only thing we can control is our preparation and our time on the stage. We cannot control the outcome and just have to accept it, learn from it and move on. I think you answered your own question re "professionalism". Toastmasters is for amateurs and is unlikely to change from it's present setup. A very small number of speakers DO go on to be professionals, usually by joining a professional speaking organisation (Such as NSA) where talent is recognised. Outside of Toastmasters, the 5 - 7 minute speech is laughed at. Maybe for the world championships only the judges should be professional speakers to encourage a higher standard of speaking and less formulaic? How many times do I have to go to be considered a "serial" contestant? hehe Only twice so far. I mostly agree with you as far as "dramatics" weighing too much in these speeches, however, whatever assists in getting your message through to the audience is beneficial. I had Darren and Aaron both picked for 1st and 2nd. 3rd place was up for grabs, IMO and probably could have been one of the DQed contestants. I enjoy your writing and I respect your opinion. I didn't see Thien's speech so cannot relate, but I disagreed with the winners in my semifinal so I understand the sentiment. I'm puzzled, Darren. How could you have Darren and Aaron picked for 1st and 2nd place, if you didn't see all of the speakers? Once again, a great post. Your honesty is among the reasons I like your blog and your speeches. Keep winning anyway! I came to admire your sincerity and devotion in 2008 and your perceptiveness continues to this day. May your blog lead to books of wisdom that we can all benefit from, both 5-7 minute amateurs and one hour keynoters. May your comments be read by thousands. I was there at the Convention, and I tend to agree with your honest assessment. Thanks for this post. I have been looking for something like this for year’s thank you! Welcome to Speak & Deliver! CLICK image to purchase! 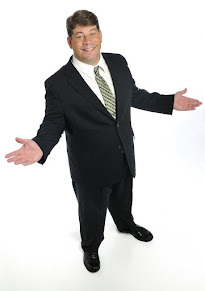 Get your audience Laughing - and Learning!